This Nikon P-223 3-9x40 Mate BDC 600 review is designed to guide you into understanding this highly innovative piece of technology. The Nikon P-223 is most common among experienced hunters or shooters for its high accuracy level. This modernly developed rifle scope is composed of BDC 600 reticle which correctly compensates for your rifle trajectory. Similarly, this reticle has been precisely designed for the path of the 5.56 NATO round/223 Remington which uses the 55-grain polymer-tipped bullet. The reticle also provides the shooters harsh marks from 100 to 600 yards and open aiming points. With this rifle scope, you can quickly and precisely zero-in on the target without losing your important settings. Not many scopes within the same price range as the Nikon P-223 have this features. The elevation knobs and the tactical style windage provide room for customizability and making of necessary adjustments. Furthermore, this rifle scope has the Nikon’s Zero-Reset feature, which makes works a lot easier for you while using the gadget. In fact, with this device characteristic, all you have to do is select the range, line up the shot, and take down your target. Better still, the turrets are directly accessible, and its adjustments are quite crisp. The Nikon P-223 offers maximum convenience in usability. It is a durable, well-constructed scope that even handicapped persons can use effortlessly at the field. Besides, this riflescope is generally easy to use, which makes it perfect for both learners and experienced users alike. Since it has no caps on it, users are relieved from the troubles associated with removing and possibly misplacing them. Similarly, after sighting the scope in, you pull out on the turrets and turn them to zero in six clicks in either direction without interfering with the settings. The flexibility of a rifle scope’s magnification range contributes to its general efficiency. The Nikon P-223 uses a 40 mm objective lens that provides a magnification range from 3x to 9x. This remarkable eminence makes it the perfect riflescope for a wide variety of AR platforms and uses. 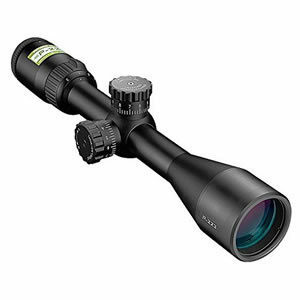 Consequently, the scope is best suited for various fields from range work to hunting applications. The lens provides exceptional optical quality and offers excellent resolution and clarity. Furthermore, you can effortlessly zoom or adjust the magnification. Shooting in low-light situations requires rifle scopes with effective light transmission such as the Nikon P-223 3-9x40 Mate BDC 600. Most animals tend to be most active in the dark, but with effective light transmission through your rifle scope, you can still spot your target just right. This Nikon rifle scope features an optical system that is fully multicoated. When light hits the objective lens, it goes through various glasses before getting into the eye, which can cause an unwanted reflection that might resultantly affect your visibility. However, the Nikon P-223 is thoroughly coated to prevent such unwanted reflections. Q: What is the aiming range of the scope? A: The Nikon P-223 can be zeroed at 100 yards and adjusted out to 800 yards. Q: How long is the scope? A: It features a matte black finish that prevents light reflection hence provide a camouflage. 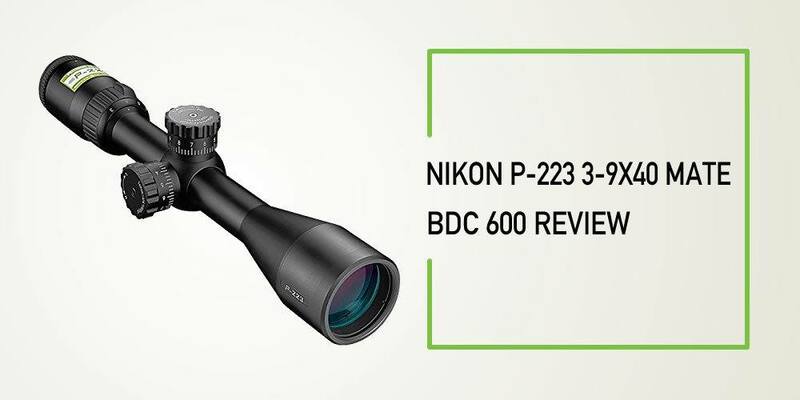 The Nikon P-223 3-9x40 Mate BDC 600 still stands out as one of the most dependable rifle scopes on the market today. It offers many amazing features that most riflescopes within its price range cannot rival. Likewise, it performs better than its more expensive counterparts on the market. Therefore, I would recommend it to anyone who would want to acquire the best possible scope at a reasonable price.